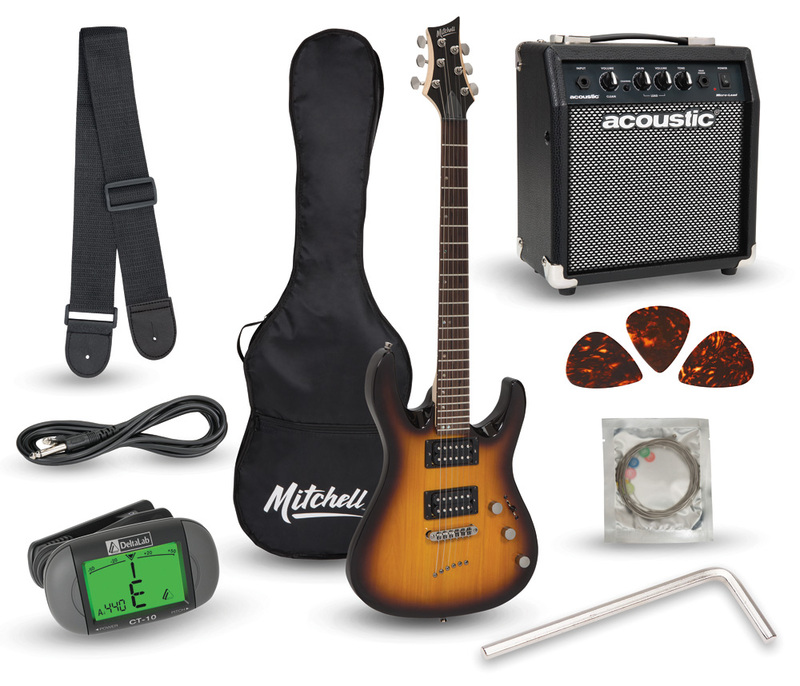 Mitchell unveiled three new “Launch Packs” that provide everything a beginning guitarist needs to start playing right away. 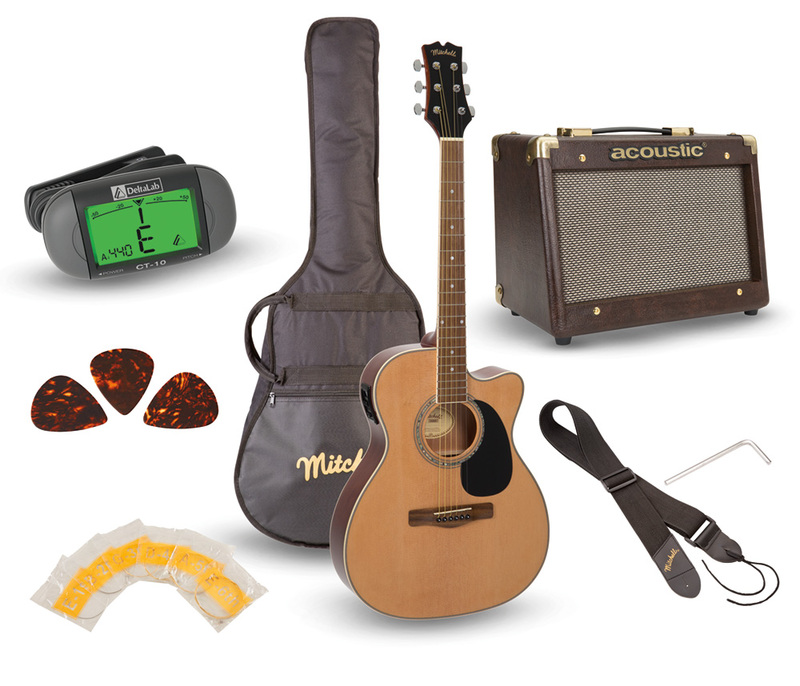 Each Launch Pack includes a Mitchell guitar, an Acoustic® brand guitar amplifier, protective gig bag, woven guitar strap, ten-foot guitar cable, DeltaLab CT10 clip-on tuner, extra set of guitar strings, and set of guitar picks. Mitchell’s O120PKE Acoustic-Electric Guitar Launch Pack features the company’s rich, warm-sounding O120CE auditorium-size acoustic-electric guitar. The O120CE gets plenty loud and has a single cutaway for easy access to higher frets. Forward shifted, scalloped X-bracing provides a full tone, while the spruce top and mahogany back, sides, and neck produce lush overtones. High-ratio diecast machine heads ensure easy tuning. An onboard preamp with three-band EQ enables you to adjust the sound so it’s just right. The O120CE looks as sweet as it sounds, with an attractive, bound walnut fingerboard and abalone rosette. The Acoustic-Electric Launch Pack pairs the O120CE with an Acoustic® A15 combo amplifier. With its 6.5-inch speaker, 3-band EQ, and built-in chorus effect with speed control, the 15 Watt A15 produces an outstanding, room-filling sound. The amp offers a 1Ž4-inch input jack and a headphone jack. The MD150PK Electric Guitar Launch Packs for beginning rockers feature Mitchell’s MD150, a modern electric guitar with a double-cutaway for easy access to the higher frets. One version of the pack boasts a sunburst MD150, while the other provides a black MD150. Two high-power ceramic humbucking pickups with individual volume controls, a tone control, and a three-way pickup switch enable a variety of sounds. An adjustable, TOM-style bridge delivers solid intonation, while the string-through body design produces superior sustain and tone. Attractive black nickel hardware is employed throughout. You also get an Acoustic® Micro-Lead combo amp, which delivers 15 watts of robust power through a 6.5-inch speaker. The Micro-Lead sports a 1/4-inch input jack that feeds a clean channel for sparkling chords or an aggressive lead channel with adjustable gain that produces a wide range of distortion sounds. A headphone jack is included so you can practice without incurring your neighbor’s wrath.